The B-52’s have been creating their own unique brand of music for nearly 40 years. At the age of 66, Kate Pierson, one of the band’s founding members, has finally released her first solo album. Guitars and Microphones makes you wonder why it took so long. This is an album you can listen to without skipping tracks and with only 10 songs it’s an easy listen. Much like the B-52’s, the lyrics are often quirky and the music doesn’t fit into one definable category. Working with Sia (who served as executive producer and co-writer), Pierson has crafted a fun record you can certainly dance to. Her voice is still strong and the production, while reminiscent of the ‘80s, doesn’t sound dated. With songs like the autobiographical title track and “Mister Sister” (which Pierson intended as an a trans-gender anthem), this is not just for B-52s fans. The term “pop music” is often used in a derogatory way. Pierson and her collaborators show that it doesn’t need to be. I highly recommend Guitars and Microphones and look forward to another Kate Pierson solo effort. 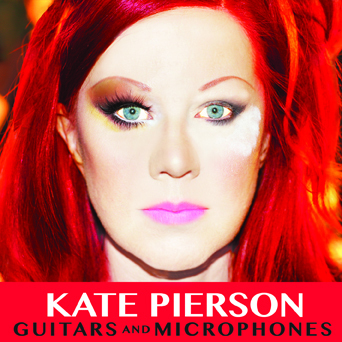 The first question I would ask Kate Pierson if I were to interview her is “What took you so long to make a solo album?” After giving Guitars and Microphones a few spins I can tell everyone that this is an exciting release. I like the fact Pierson kept it simple with only ten songs. It seems many artists overload their new releases with too many songs which brings down the release when they load it up with filler. Looking back that is why albums from the seventies and eighties stand the test of time better as the releases concentrated on quality not quantity. Pierson sounds like a woman half her age and plays the style of music one would expect. Standouts include opener “Throw Down The Roses”, “Mister Sister” and the sing-a-long “Bring Your Arms”. There really isn’t a throwaway track on the whole album. If you want to digest some good pop music that is not overproduced like many of today’s new releases then you’ve come to the right place. Now if only Pierson will tour behind Guitars and Microphones, that would make many people, shiny and happy.